Those who read this column regularly - and thank you to those who do - will have noticed that I praise more films than I pan. There are several reasons for this, not the least of which is the fact that if all you ever do is complain about how lousy movies are, your credibility goes down. You become, in essence, the Mikey of film reviewing: you hate everything. Another big reason is simply that it's easier to write about something you thoroughly enjoyed than something you didn't like, and since few films induce a feeling of outright hatred, there's less impetus for the muse; an average film begets an average response, and that makes it harder to summon up more than a sentence or two about its mediocrity. But part of my mission statement is to help fellow spook-movie fans avoid timewasters, and when an intriguing concept results in a below-average result, I feel it incumbent upon me to call it out and help others spend their precious film-viewing time on more deserving fare. Which brings me to this week's subject, The Order, a prime example of an interesting concept gone horribly wrong in its trip to the screen. As always, I offer a spoiler warning, in case any of you decide you'd prefer to spend 102 minutes of your life witnessing mediocrity in action for yourself. The film focuses on Heath Ledger's Alex Benier, one of the last remaining priests of a little-known Catholic order which, in the first of its historical inaccuracies, the film identifies as the Carolingians. Never mind that that was a medieval ruling family in the Frankish Empire and later France; the filmmakers want them as a Catholic sect and so they shall be. At any rate, the film's Carolingians believe in all the mystical things that the modern Catholic Church does not: possession, demons assuming human form, hauntings and other stuff that present-day dogma barely acknowledges, much less supports. It also gets mentioned that the Carolingians believed in the practice of sin-eating, although whether they themselves ever practiced it or not is never made clear, as that might get in the way of the plot contrivances to follow. Father Benier and Father Thomas, who is apparently the only other remaining Carolingian, are sent to Rome to investigate the death of their mentor, the former head of their order. Accompanying them is Mara, a young woman who was committed to a mental institution after trying to kill Father Benier the year before. She has been mysteriously called to join them - I say "mysteriously" because, like many things in this movie, it's never explained how she knows about any of this - and escapes from the asylum in order to make the journey. Once in Rome, Fathers Benier and Thomas are told the church has ruled their mentor's death a suicide, thus preventing him from being buried in hallowed ground. We find out shortly after this that their mentor had also been excommunicated, which I believe would also have prevented him from being buried in Catholic church-consecrated ground, so the suicide angle is superfluous at best, but it soon becomes apparent that logic is about as high on the filmmaker's list of important items as historical accuracy. These discoveries also beg the question of why the two remaining Carolingians were called to Rome in the first place, but we can at least infer that it was to satisfy the demands made of the mentor by the sin-eater. And here's where we really begin to go off the tracks. Sin-eating was an actual practice in medieval times; the belief was that if a meal was eaten off the body of the deceased shortly after his demise, the sins would be absorbed by the diner and the deceased's soul could then enter Heaven. The practice was performed by the poor for the rich, for in addition to a handsome meal, the sin-eater was also paid; sin-eating became the only way some poor folk could provide for their families. Interestingly, in addition to being an upper-class indulgence, it also seemed to have been practiced on both sides of the equation only by the male of the species; whether that was because women to the manor born were viewed as not participating in any hugely sinful activities or because it was thought they didn't deserve any special intervention if they did die with sins upon their soul isn't clear. In The Order, however, the sin-eater is an immortal being of some kind who comes to the aid of those whom, for one reason or another, the Catholic Church will not provide last rites. Now, even given the percentage of Catholics amongst the entire population of the Earth, and the percentage of those that would not, for whatever reason, qualify for last rites, it still seems like having only one sin-eater would make for quite the line of dying folks queuing up for his services. And since the sin-eater here has to be there prior to the person's death, much as a Catholic priest must administer last rites before the person dies, that makes things even more hectic, I would think. The fact that the movie gave me ample time to ponder these and other points gives you some idea as to how riveting the film was. After a whole lot of non-action, nearly every bit of which the movie telegraphs long before it happens, it turns out a sin-eater must pass on his calling in order to go to his eternal rest. He also passes along all of the sins he's eaten, along with all the knowledge he's gathered from everyone whose sins he's eaten. Ultimately, Father Benier becomes the sin-eater, thus gaining all this knowledge and being consigned to live, eating other people's sins, until he finds a replacement. Watching this film is akin to watching paint dry. The problems are myriad, but there are a few that really struck me as I struggled through to the end of the hour-and-three-quarters. First, the film reveals its ending in the first scene. Now, this in itself is not necessarily a deal-breaker; many a film has telegraphed its ending from practically the opening credits, but the journey in reaching that end is still an entertaining one. Not so with The Order. Not only does the film tell you how it will end, it also sets up the plot so that you know exactly how things get to that end-point before the conclusion of the first reel. Second, the film suffers from Ebert's Idiot Plotline problem. It's so very obvious at so many points what the sin-eater wants from Father Benier and to what lengths he will go to get it that if anyone in the ENTIRE film had two brain cells to rub together, they'd have stopped the plot inside 20 minutes. It's that freakin' obvious. Third, and I've brought this up before with films, The Order completely ignores the historical reality of sin-eating. Now I know we don't go to Hollywood movies expecting complete and total accuracy, whether it be historical or biographical or what-have-you. But when a film is based upon an actual person or practice, it does open itself up to comparison with the person/place/thing on which it is based. If departure is to take place, it should be adequately set up within the film's universe so as to dispel any need for comparison with fact. The Order doesn't even do a good job of explaining the exact mechanism of its own sin-eating, much less why it's so vastly different from the historical practice. Fourth, there's a plot hole in the final reel that you could drive a Mac truck through. After the sin-eater convinces Benier to make love to Mara - and since she's given no other reason in the film to have been called to join the priests in Rome, it's fairly obvious the writer didn't care to elevate her above plot-contrivance status - the sin-eater kills her, arranges it to look like a suicide, then leaves the implements for eating sins beside her body. Now putting aside for the moment the fact that anyone with half a brain would've wondered at the ulterior motives of a being who has expressed his desire to pass on to the next plane of existence but must choose a successor before he can die telling a priest to make love to the woman he wants. But here's the real problem with the scenario: there's no reason that Benier can't give Mara last rites. Benier has a line about being unable to administer last rites because he's "not a priest any more", but that patently makes no sense. No one knows he's broken his vows, he hasn't officially left the church, and he knows Mara didn't commit suicide. So what's the problem? And to those who would reply, "God knows he broke his vows", well, God also knows Mara didn't commit suicide, so again, where's the obstacle? Besides, as far as anyone on Earth knows, God doesn't care one whit about whether a person receives last rites or not; that's a Catholic construct, and seems a ritual that is performed more for the dying Catholic's peace of mind and the comfort of his family. For all we know, God hates the last rites and wishes everyone would stop with all the fuss already. 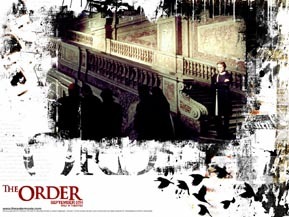 But the worst sin that The Order commits is the most heinous one any film, especially a horror film, can commit: It's boring. They talk and talk and talk about Catholic dogma, and then just when you think no one anywhere could ever possibly utter another word about Catholic dogma, they talk about it some more. In fact, there's so damned much talk, you'd think you were watching someone's Master's thesis in Theology rather than a movie. And any intriguing idea that is raised in the film - for instance, how a dying man can answer any question put to him, regardless of what is asked - is almost immediately thrown away, apparently because you just can't have enough talk about Catholic dogma. It's as though Brian Helgeland, who wrote as well as directed, had a bunch of ideas when he was writing the script, and instead of choosing one and fleshing it out to make a feature-length film, decided to give them all one scene in the script, and then spend the rest of the time discussing dogma and decrying the Catholic Church for hewing too close to the rules. And that, come to think of it, may actually be The Order's worst transgression of all: there's an interesting movie in here somewhere, but nobody took the time and effort to figure out what it might be. Instead, we have the proverbial sound and fury signifying nothing. Except this time, the filmmaker left out the fury.